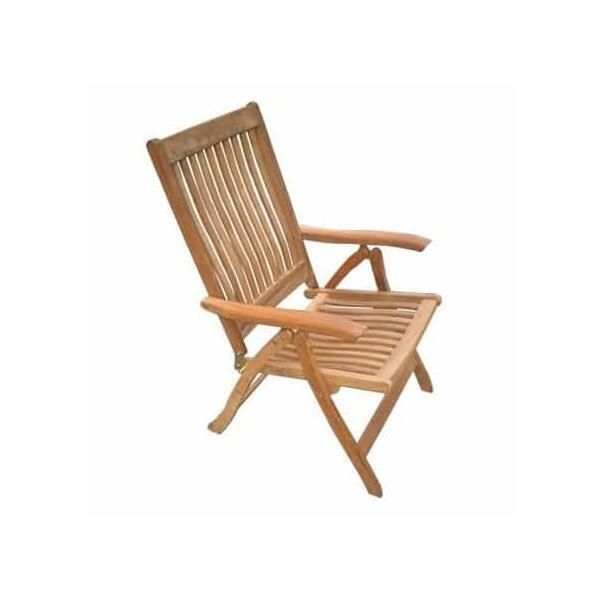 Natural & Water-Resistant Royal Teak Patio Furniture - The Best Wood Option! 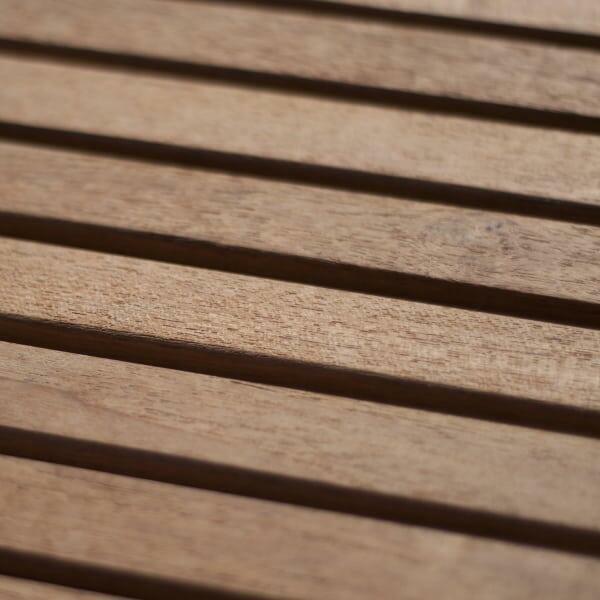 Teak wood, the reliable hardwood found growing in rainforests and jungles in Southeast Asia. Extremely dense and packed with natural oils that repel water when compared to other types of wood, this organic material has been used for centuries by shipbuilders and other craftsmen for objects and areas that are constantly exposed to water. 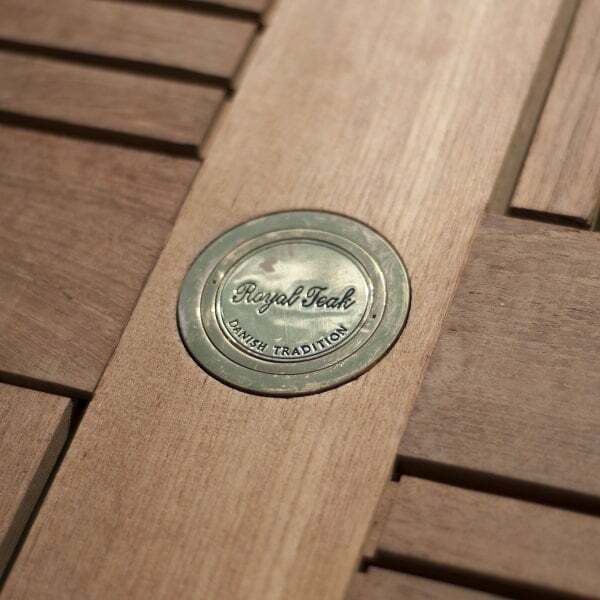 The Estate Teak Dining Collection from Royal Teak Collection brings this cherished material to your patio, deck or sunroom, with a comfortable five-position dining chair unlike anything else in the wood patio furniture industry. The Estate Reclining Arm Chair features stainless steel hardware, folds flat for easy storage and can move from the standard upright dining position down to a fully-reclined position. With these features, cushions and a high back, this chair is quite possibly the most comfortable patio dining chair available. 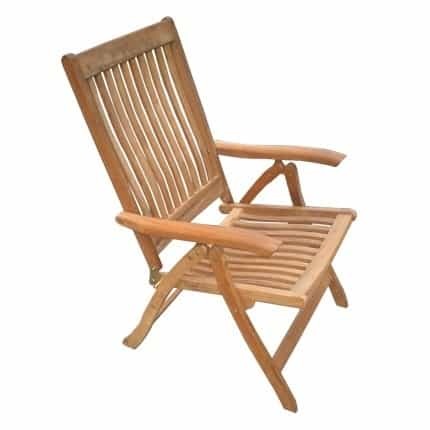 Place several of these chairs around any of the table options listed below, or let one stand in the corner of a garden or porch paired with an ottoman or side table. These functional seating options are quite versatile! 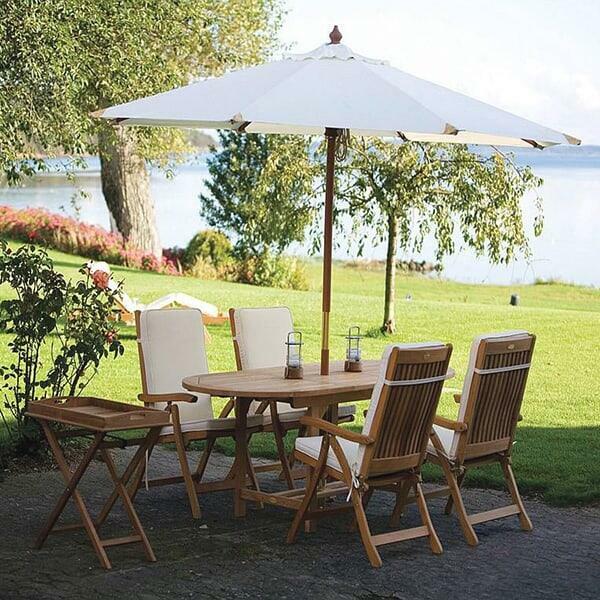 If you desire a natural look out in your outdoor room or outdoor space, you must consider the Estate Teak Dining from Royal Teak Collection, which comes with free shipping nationwide from Family Leisure. Featured Set Includes: Small 60/78 Oval Table With 4 Dining Chairs. W 30.5" x D 32" x H 32" LBS 50 SEAT HEIGHT 17"
W 35" x D 60"-78" x H 29.5" Weight: 130 Lbs. W 39" x D 72"-96" x H 29.5" Weight: 168 Lbs. W 39" x D 96"-120" x H 29.5" Weight: 190 Lbs. W 35" x D 60"-78" x H 29.5" Weight: 140 Lbs. W 39" x D 72"-96" x H 29.5" Weight: 180 Lbs. W 39" x D 96"-120" x H 29.5" Weight: 205 Lbs. W 39" x D 72"-94" x H 29.5" Weight: 220 Lbs. W 43" x D 84"-101"-118" x H 29.5" Weight: 250 Lbs. W 35" x D 63" x H 29.5" Weight: 145 Lbs. W 43.5" x D 96" x H 29.5" Weight: 204 Lbs. W 60" x D 60" x H 29.5" Weight: 140 Lbs. W 72" x D 72" x H 29.5" Weight: 200 Lbs.